We were fortunate to participate recently in the competition to design the New Camp Nou for FC Barcelona. An intense 6 month design process resulted in an innovative and stunning proposal, the consequence of a rewarding design collaboration with International practice Populous and the other catalan practice RCR Arquitectes, as well as a wider multi-disciplinary team. Camp Nou is the iconic club stadium of world football; it is a living, breathing expression of so many aspects of Catalan culture and society. Our design strived to express this culture in every detail, creating something unique in world football; acknowledging the fundamental role the stadium currently plays in the city and seeking to amplify its presence and influence to a new level. The stadium and its surroundings are both a canvas for, and a window into, Catalan life and passions. 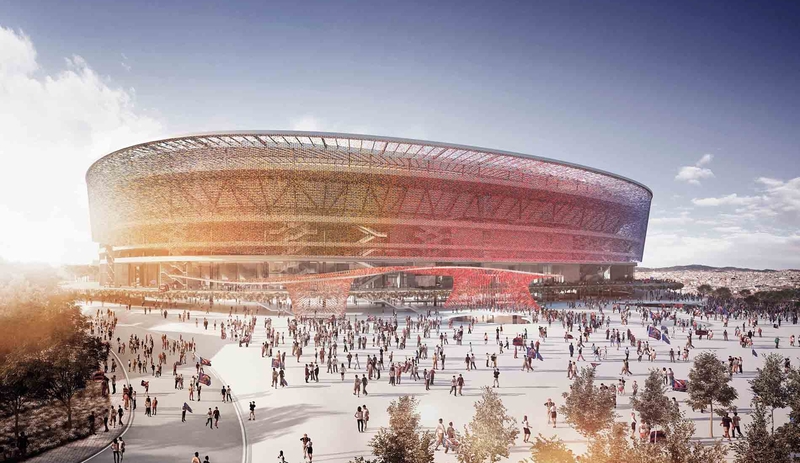 Our team’s design imagined a connected, permeable stadium, creating a seamless experience between inside and outside. By day the many layers of the building provide visual references to the stadium’s history, whilst providing new opportunities for visitors to spend time within the stadium, giving them new perspectives into the immediate surroundings and the whole city.